1. Bake McCain® Superfries® Straight Cut according to package directions. Stir garlic powder with cumin; toss with McCain® Superfries® Straight Cut to coat. 2. Meanwhile, in pan, melt butter over medium heat; cook onion, garlic and ginger, stirring occasionally, for about 5 minutes or until onion is slightly softened. Add curry powder, garam masala, salt and pepper; cook for 1 or 2 minutes or until fragrant. Add tomato paste; cook for 1 minute. Add tomatoes and cream; bring to boil. Reduce heat to low; simmer for 15 to 18 minutes or until thickened. 3. Serve McCain® Superfries® Straight Cut with curry sauce and garnish with coriander. 4. Tip: Serve with a dollop of tzatziki sauce or yogurt if desired. 5. tsp curry powder, 1 tsp paprika and pinch of cayenne pepper. 1 Bake McCain® Superfries® Straight Cut according to package directions. Stir garlic powder with cumin; toss with McCain® Superfries® Straight Cut to coat. 2 Meanwhile, in pan, melt butter over medium heat; cook onion, garlic and ginger, stirring occasionally, for about 5 minutes or until onion is slightly softened. Add curry powder, garam masala, salt and pepper; cook for 1 or 2 minutes or until fragrant. Add tomato paste; cook for 1 minute. Add tomatoes and cream; bring to boil. Reduce heat to low; simmer for 15 to 18 minutes or until thickened. 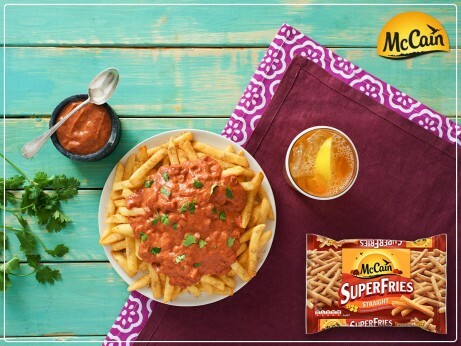 3 Serve McCain® Superfries® Straight Cut with curry sauce and garnish with coriander. 4 Tip: Serve with a dollop of tzatziki sauce or yogurt if desired. 5 tsp curry powder, 1 tsp paprika and pinch of cayenne pepper.